From the early efforts that emerged in the struggle against Nazism, and over the past half century, the field of genocide studies has grown in reach to include five genocide centers across the globe and well over one hundred Holocaust centers. 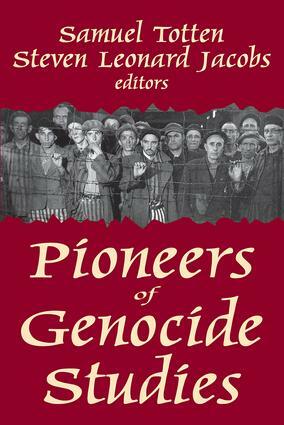 This work enables a new generation of scholars, researchers, and policymakers to assess the major foci of the field, develop ways and means to intervene and prevent future genocides, and review the successes and failures of the past.The contributors to Pioneers of Genocide Studies approach the questions of greatest relevance in a personal way, crafting a statement that reveals one's individual voice, persuasions, literary style, scholarly perspectives, and relevant details of one's life. The book epitomizes scholarly autobiographical writing at its best. The book also includes the most important works by each author on the issue of genocide.Among the contributors are experts in the Armenian, Bosnian, and Cambodian genocides, as well as the Holocaust against the Jewish people. The contributors are Rouben Adalian, M. Cherif Bassiouni, Israel W. Charney, Vahakn Dadrian, Helen Fein, Barbara Harff, David Hawk, Herbert Hirsch, Irving Louis Horowitz, Richard Hovannisian, Henry Huttenbach, Leo Kuper, Raphael Lemkin, James E. Mace, Eric Markusen, Robert Melson, R.J. Rummel, Roger W. Smith, Gregory H. Stanton, Ervin Staub, Colin Tatz, Yves Ternan, and the co-editors. The work represents a high watermark in the reflections and self-reflections on the comparative study of genocide.